We'd like to share pictures of our garden adventures using worm castings fertilizers. 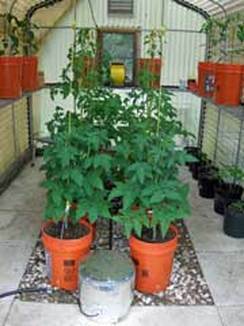 Our tomato plants we planted in self-watering containers in the greenhouse. Our potting mixture was worm compost (peat moss and horse manure the worms had feasted on.) We fertilized with Black Castings™ , VermaPlex®, and VermaMax® only. The worm castings were mixed into the potting soil mix, then VermaPlex® was added to the water reservoir for a continuous feed. Once the plant was established, VermaMax® granules were added as a side dressing. Hang on, our German Johnson heirloom tomatoes are just about ready to eat.